Pamela Hopkins asks the Gallipolis City Commission to pay for her damaged vehicle after a pole reportedly fell on it. 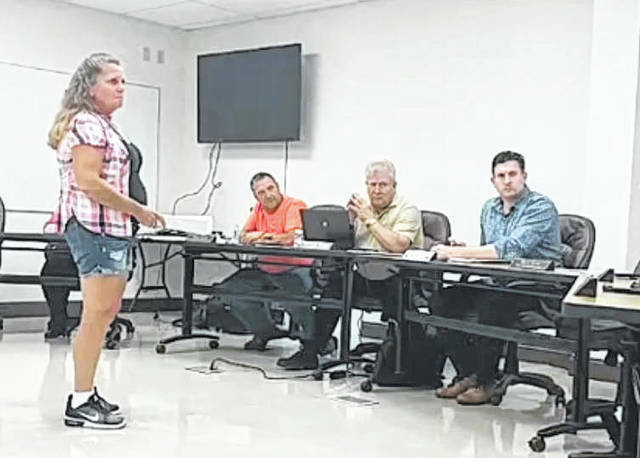 GALLIPOLIS — A Gallipolis woman’s request was turned down after she approached Gallipolis City Commission Tuesday evening to ask that the city consider paying for her vehicle that was reportedly damaged by a fallen light pole on Second Avenue. Hopkins said she inspected the vehicle as it had a cracked windshield, damaged hood and front. She took photos of the event and brought an individual who said they were a witness to seeing the pole on the car to the meeting. Hopkins claimed she tried to resolve the matter with City Manager Gene Greene without success. Hopkins claimed she had a report from Gallipolis Police Department that said “the plate had rusted away and the bolt had come through” in regards to the pole. Hopkins said she was told the city was going to refuse to pay for her car and that Greene had walked away from her because she said she had gotten legal advice from “a secretary.” She said she did not have an attorney. Hopkins said she understood someone had been chaining a bike to the pole. Salisbury said he wasn’t trying to argue the facts of the event other than city officials had heard there was someone potentially pushing on the pole while trying to chain a bike to it or that someone had been watering flowers on the pole. Hopkins responded she told Greene she did not have an attorney. She had told him she had gotten legal advice from a secretary. She claimed Greene had responded that as long as she had gotten legal advice he did not have to talk to her. “Ma’am, it’s not that we don’t want to talk to you, it’s that we are not permitted to talk to you,” said Salisbury. Hopkins asked who would she go to then. Salisbury responded to her attorney’s office. She responded she did not have an attorney. Salisbury said he hoped she could understand why city officials might be reluctant to talk to her if they felt she had represented that she had an attorney at one point. He asked who was chaining the bike up or may have pushed the pole. Hopkins felt someone chaining a bike to a pole should not be pushing a pole hard enough for it to fall. Greene spoke up and said according to reports a Michael Wilson had said he was attempting to tie a bike around the pole when it began to fall. He tried to stop it but it was too heavy to stop. Hopkins replied she felt it was negligent because the pole was rusted and broken and should be maintained. Nan Harder stood as a witness to the event and shared her recollection. Salisbury, after the meeting, would later cite 2744.02 and 2744.03 as the passage of the Ohio Revised Code discussing legal immunities. Commissioner Cody Caldwell asked if the city had any prior knowledge of that pole being broken to which Greene replied no. Harder said she felt all the poles with flower pots should be checked as they were being watered and she felt poles could be rusting. Hopkins said she just wanted her car fixed. Commission President Mike Fulks said he didn’t think the commission was in a position to do that with its insurance company’s opinion feeling the city was not liable. Hopkins emotionally said she felt the city was wrong and she should not have to drive a broken vehicle due to the negligence of someone else. Another unidentified man followed Hopkins out saying that what was being done was wrong and that she was a citizen of the city as well.